I saw this beer awhile back at a Fred Meyer grocery store and bought it since I had never seen it before. This is the Steam Pumper IPA from the Fire Station 5 Brewing Company. The Fire Station 5 Brewing Company is actually just a label brand name for a set of beers brewed specifically for the Fred Meyer grocery stores. Kind of an in-house set of microbrews, if you will. They are actually made by MacTarnahan's Brewing Company (which is affiliated with Pyramid Breweries) out of Portland, Oregon. When you get into the big corporate companies owning smaller breweries and then putting out beers under several different labels/brands, it all gets a bit confusing. Oh well, the beer is what really matters here. 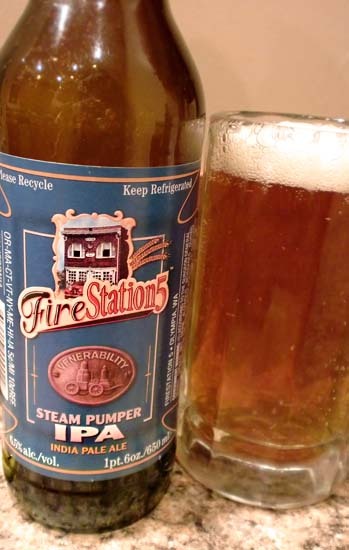 The Steam Pumper IPA comes in at a respectable 6.5% alcohol, but only 49 IBU's which is weak for any IPA in my book. Steam Pumper pours a nice golden/copper color with a decent white head and a small bit of lacing. It smells sweet and butterscotchy with surprisingly subdued piney hops. Tasting is as I was expecting from the aromas: sweet, butterscotch and caramel malts, a bit watery and thin, with mildly piney bitter hops that don't linger very long in the finish. Drink This: if you're new to IPA's and want a very mild one. Don't Drink This: if you're looking for a real India Pale Ale.